When my father was "courting" my mother, he gave her figurines, mostly cats. I thought it was incredibly romantic. Sigh. As a young girl, I loved the porcelain Siamese kitten figurines. They were soft and sweet, with big blue eyes. Happy Valentine's Day dear friends! They're adorable! Happy Valentine's Day! I remember so well thinking they were real -- aren't they? How adorable! Happy V Day. Courting? What's that? Hello DATING is barely in my vocabulary! It was nice to meet you in person! Now I know the face behind the blog (and book of course!). Happy Valentines Day from all of us at the Katnip Lounge. those are precious! I love the "rear end" views! 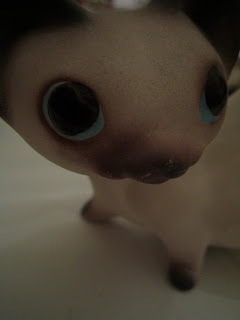 I wonder if your love of cats started BEFORE the figurines or did they have something to do with it? I sooooo wish I had been able to meet you all in NY this past weekend, sounds like you all had a fabulous time!! Happy Valentine's Day My Wonderful Friend! To answer your question, there were 6 and 3 but we lost Crystal a year ago, so he's up there facing the other direction. Gracie has been good about remembering Crystal when she's made us a header. So, so sweet! Hope you enjoyed a wonderful V-Day!